Natural gas patio heaters are a great way to add heat to your outdoor space by using your natural gas line. Since they require installation, natural gas patio heaters are more permanent than propane patio heaters or electric patio heaters. Cleaner to run than propane, natural gas produces a greater usable heat output and does not require refilling of a tank. Fitting a natural gas patio heater into your outdoor space is easy if a natural gas line is already installed – however, it may be costly to run a natural gas line and may require professional installation. 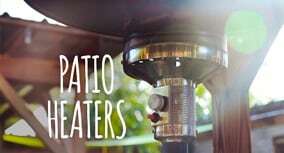 Before deciding on a natural gas patio heater for your outdoor space, measure the area that needs to be heated and determine where the heater will be placed. Patio heaters can be wall mounted or mounted by a post into the ground, hung from the ceiling, or simply stand on its own. Once you’ve determined the heating area and location, choose the style that best fits your outdoor room.